The Redemptorists (Congregation of the Most Holy Redeemer – C.Ss.R.) 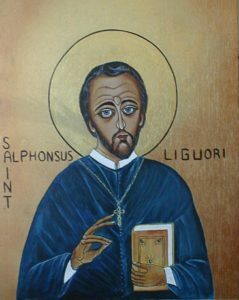 are a congregation of religious men founded by St. Alphonsus Ligouri in 1732. Its 5000 members minister in 77 countries in the world. The purpose of the Redemptorists is to follow the example of Jesus Christ in preaching the Good News to the most abandoned, especially the poor. The Redemptorists have been present in the Ukrainian Catholic Church since 1906, when Fr. Achilles Delaere, C.Ss.R. receive permission to change rites in order to serve the immigrant Ukrainian Catholics in Canada. The Redemptorists, upon the invitation of Metropolitan Andrew Sheptytsky, then came to Ukraine in 1913. Blessed Vasyl Velychkovsky joined the Redemptorists in 1924 in Ukraine. When Blessed Vasyl, who died in Canada in 1973, was beatified by St. John Paul II, Pope of Rome, the Redemptorists built the Shrine and Museum which are attached to St. Joseph’s Ukrainian Catholic Parish in Winnipeg where they serve. The Redemptorists have now taken on the task to promoting devotion and knowledge of our Bishop and Martyr.